Lots of people wonder when the optimal time is to go for a run. In short, there isn’t one specific time that works best for everybody. The best time to go for a run is usually when it works best for you as an individual. That said, there are some times throughout your day when going for a run will benefit you more than others. If you’re struggling to decide when you should go for a run, below are 4 perfect recommendations for you. Lots of people might say that the morning is hands-down the best time to go for a run. That’s not always the case, however. Many people who wake up in the morning to run often don’t have time to eat beforehand. While fasted cardio is popular among quite a few fitness circles, that doesn’t mean it works for everyone. Some people perform much better when they’re properly fueled. If you’re one of those people and don’t have time to grab a snack or a meal before your morning run, then it might be a good idea to choose a better time for you. Oftentimes after a long meeting or grueling work session, productivity plummets. That’s when running can be an incredible way to get your blood pumping and refresh your mind during the workday. For example, let’s say you’re a stock market investor and just got out of a morning-long live trading room with your colleagues. Even though you likely learned a ton of valuable information, you’re probably going to feel pretty drained. Hitting the gym or stepping outside for a run can be exactly what you need to power through the rest of your afternoon. There is no better way to instantly relieve yourself of some excess anxiety than by going for a run. That’s why the recommendation here is to get after it anytime you’re feeling more anxious than usual. 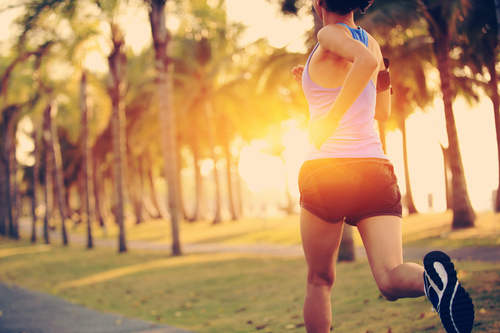 Running has been shown to release endorphins in similar ways that drugs affect your body. This means you get all the feel good vibes post-run without the negative effects of pharmaceuticals. Last but not least, one of the best times to go for a run is when you know you will actually do it. What good is scheduling a lunch-time run if your job isn’t very conducive to making that happen? Or, if you know that your wife and kids are relying on you for after work and school activities in the evenings, maybe that’s not the best time to go for a run. In this case, mornings may be better. Running is without a doubt a very healthy habit to get into. If you’ve been struggling to find the one perfect time when you should run, hopefully this article has helped inform you that the best time for you depends on a number of different factors. Use what you learned above to determine a time that works for you. Save More on Your Auto Insurance Rate Quote!